Intracerebral hemorrhage (ICH), also known as cerebral bleed, is a type of intracranial bleed that occurs within the brain tissue or ventricles. Symptoms can include headache, one sided weakness, vomiting, seizures, decreased level of consciousness, and neck stiffness. Often symptoms get worse over time. Fever is also common. In many cases bleeding is present in both the brain tissue and the ventricles. Causes include brain trauma, aneurysms, arteriovenous malformations, and brain tumors. The largest risk factors for spontaneous bleeding are high blood pressure and amyloidosis. Other risk factors include alcoholism, low cholesterol, blood thinners, and cocaine. Diagnosis is typically by CT scan. Other conditions that may present similarly include ischemic stroke. Treatment should typically be carried out in an intensive care unit. Guidelines recommended decreasing the blood pressure to a systolic of less than 140 mmHg. Blood thinners should be reversed if possible and blood sugar kept in the normal range. Surgery to place a ventricular drain may be used to treat hydrocephalus but corticosteroids should not be used. Surgery to remove the blood is useful in certain cases. Cerebral bleeding affects about 2.5 per 10,000 people each year. It occurs more often in males and older people. About 44% of those affected die within a month. A good outcome occurs in about 20% of those affected. Strokes were first divided into their two major types, bleeding and insufficient blood flow, in 1823. Patients with intraparenchymal bleeds have symptoms that correspond to the functions controlled by the area of the brain that is damaged by the bleed. Other symptoms include those that indicate a rise in intracranial pressure caused by a large mass putting pressure on the brain. Intracerebral hemorrhages are often misdiagnosed as subarachnoid hemorrhages due to the similarity in symptoms and signs. A severe headache followed by vomiting is one of the more common symptoms of intracerebral hemorrhage. Another common symptom is a patient can collapse. Some people may experience continuous bleeding from the ear. Some patients may also go into a coma before the bleed is noticed. Intracerebral bleeds are the second most common cause of stroke, accounting for 10% of hospital admissions for stroke. High blood pressure raises the risks of spontaneous intracerebral hemorrhage by two to six times. More common in adults than in children, intraparenchymal bleeds are usually due to penetrating head trauma, but can also be due to depressed skull fractures. Acceleration-deceleration trauma, rupture of an aneurysm or arteriovenous malformation (AVM), and bleeding within a tumor are additional causes. Amyloid angiopathy is a not uncommon cause of intracerebral hemorrhage in patients over the age of 55. 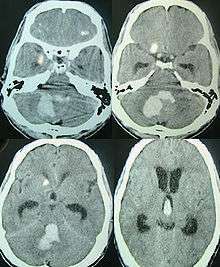 A very small proportion is due to cerebral venous sinus thrombosis. Infection with the k serotype of Streptococcus mutans may also be a risk factor, because of its prevalence in stroke patients and production of collagen-binding protein. 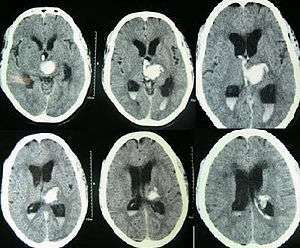 Tramautic intracerebral hematomas are divided into acute and delayed. Acute intracerebral hematomas occur at the time of the injury while delayed intracerebral hematomas have been reported from as early as 6 hours post injury to as long as several weeks. Both computed tomography angiography (CTA) and magnetic resonance angiography (MRA) have been proved to be effective in diagnosing intracranial vascular malformations after ICH. So frequently, a CT angiogram will be performed in order to exclude a secondary cause of hemorrhage or to detect a "spot sign". 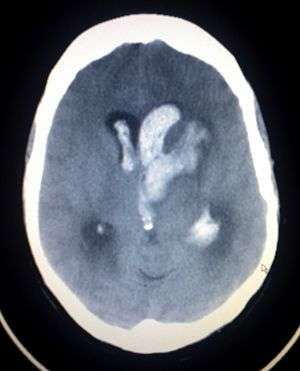 Intraparenchymal hemorrhage can be recognized on CT scans because blood appears brighter than other tissue and is separated from the inner table of the skull by brain tissue. The tissue surrounding a bleed is often less dense than the rest of the brain because of edema, and therefore shows up darker on the CT scan. Treatment depends substantially of the type of ICH. Rapid CT scan and other diagnostic measures are used to determine proper treatment, which may include both medication and surgery. One review found that antihypertensive therapy to bring down the blood pressure in acute phases appears to improve outcomes. Another review found an unclear difference between intensive and less intensive blood pressure control. The American Heart Association and American Stroke Association guidelines in 2015 recommended decreasing the blood pressure to a SBP of 140 mmHg. Giving Factor VIIa within 4 hours limits the bleeding and formation of a hematoma. However, it also increases the risk of thromboembolism. It thus overall does not result in better outcomes in those without hemophilia. Frozen plasma, vitamin K, protamine, or platelet transfusions are given in case of a coagulopathy. Fosphenytoin or other anticonvulsant is given in case of seizures or lobar hemorrhage. H2 antagonists or proton pump inhibitors are commonly given for stress ulcer prophylaxis, a condition somehow linked with ICH. Corticosteroids, were thought to reduce swelling. However, in large controlled studies, corticosteroids have been found to increase mortality rates and are no longer recommended. Surgery is required if the hematoma is greater than 3 cm (1 in), if there is a structural vascular lesion or lobar hemorrhage in a young patient. A catheter may be passed into the brain vasculature to close off or dilate blood vessels, avoiding invasive surgical procedures. Aspiration by stereotactic surgery or endoscopic drainage may be used in basal ganglia hemorrhages, although successful reports are limited. Tracheal intubation is indicated in people with decreased level of consciousness or other risk of airway obstruction. IV fluids are given to maintain fluid balance, using isotonic rather than hypotonic fluids. The risk of death from an intraparenchymal bleed in traumatic brain injury is especially high when the injury occurs in the brain stem. Intraparenchymal bleeds within the medulla oblongata are almost always fatal, because they cause damage to cranial nerve X, the vagus nerve, which plays an important role in blood circulation and breathing. This kind of hemorrhage can also occur in the cortex or subcortical areas, usually in the frontal or temporal lobes when due to head injury, and sometimes in the cerebellum. For spontaneous ICH seen on CT scan, the death rate (mortality) is 34–50% by 30 days after the insult, and half of the deaths occur in the first 2 days. Even though the majority of deaths occurs in the first days after ICH, survivors have a long term excess mortality of 27% compared to the general population. The inflammatory response triggered by stroke has been viewed as harmful in the early stage, focusing on blood-borne leukocytes, neutrophils and macrophages, and resident microglia and astrocytes. A human postmortem study shows that inflammation occurs early and persists for several days after ICH. New area of interest are the Mast Cells. It accounts for 20% of all cases of cerebrovascular disease in the United States, behind cerebral thrombosis (40%) and cerebral embolism (30%). It is two or more times more common in black than white people. ↑ Naidich, Thomas P.; Castillo, Mauricio; Cha, Soonmee; Smirniotopoulos, James G. (2012). Imaging of the Brain ,Expert Radiology Series,1: Imaging of the Brain. Elsevier Health Sciences. p. 387. ISBN 1416050094. 1 2 3 Caceres, JA; Goldstein, JN (August 2012). "Intracranial hemorrhage.". Emergency medicine clinics of North America. 30 (3): 771–94. PMID 22974648. 1 2 3 4 5 Hemphill JC, 3rd; Greenberg, SM; Anderson, CS; Becker, K; Bendok, BR; Cushman, M; Fung, GL; Goldstein, JN; Macdonald, RL; Mitchell, PH; Scott, PA; Selim, MH; Woo, D; American Heart Association Stroke, Council; Council on Cardiovascular and Stroke, Nursing; Council on Clinical, Cardiology (July 2015). "Guidelines for the Management of Spontaneous Intracerebral Hemorrhage: A Guideline for Healthcare Professionals From the American Heart Association/American Stroke Association.". Stroke; a journal of cerebral circulation. 46 (7): 2032–60. doi:10.1161/str.0000000000000069. PMID 26022637. ↑ Hennerici, Michael (2003). Imaging in Stroke. Remedica. p. 1. ISBN 9781901346251. 1 2 Vinas FC and Pilitsis J. 2006. "Penetrating Head Trauma." Emedicine.com. 1 2 3 4 Yadav YR, Mukerji G, Shenoy R, Basoor A, Jain G, Nelson A (2007). "Endoscopic management of hypertensive intraventricular haemorrhage with obstructive hydrocephalus". BMC Neurol. 7: 1. doi:10.1186/1471-2377-7-1. PMC 1780056 . PMID 17204141. ↑ Go AS, Mozaffarian D, Roger VL, et al. (January 2013). "Heart disease and stroke statistics--2013 update: a report from the American Heart Association". Circulation. 127 (1): e6–e245. doi:10.1161/CIR.0b013e31828124ad. PMID 23239837. 1 2 3 McCaffrey P. 2001. "The Neuroscience on the Web Series: CMSD 336 Neuropathologies of Language and Cognition." California State University, Chico. Retrieved on June 19, 2007. ↑ Orlando Regional Healthcare, Education and Development. 2004. "Overview of Adult Traumatic Brain Injuries." Retrieved on 2008-01-16. ↑ Kazuhiko Nakano; et al. "The collagen-binding protein of Streptococcus mutans is involved in haemorrhagic stroke". Nature Communications. ↑ Major Risk Factors for Intracerebral Hamorrhage in the Young Are Modifiable Edward Feldmann, MD; Joseph P. Broderick, MD; Walter N. Kernan, MD; Catherine M. Viscoli, PhD; Lawrence M. Brass, MD; Thomas Brott, MD; Lewis B. Morgenstern, MD; Janet Lee Wilterdink, MD Ralph I. Horwitz, MD. Published in Stroke. 2005;36:1881. ↑ Josephson, Colin B; White, Philip M; Krishan, Ashma; Al-Shahi Salman, Rustum (1 September 2014). "Computed tomography angiography or magnetic resonance angiography for detection of intracranial vascular malformations in patients with intracerebral haemorrhage". The Cochrane Library. 9: CD009372. doi:10.1002/14651858.CD009372.pub2. PMID 25177839. Retrieved 16 September 2014. 1 2 Yeung R, Ahmad T, Aviv RI, Noel de Tilly L, Fox AJ, Symons SP (2009). "Comparison of CTA to DSA in determining the etiology of spontaneous ICH". Canadian Journal of Neurological Sciences. 36 (2): 176–180. doi:10.1017/s0317167100006533. ↑ Tsivgoulis, G; Katsanos, AH; Butcher, KS; Boviatsis, E; Triantafyllou, N; Rizos, I; Alexandrov, AV (21 October 2014). "Intensive blood pressure reduction in acute intracerebral hemorrhage: A meta-analysis.". Neurology. 83 (17): 1523–9. doi:10.1212/wnl.0000000000000917. PMID 25239836. ↑ Ma, J; Li, H; Liu, Y; You, C; Huang, S; Ma, L (2015). "Effects of Intensive Blood Pressure Lowering on Intracerebral Hemorrhage Outcomes: A Meta-Analysis of Randomized Controlled Trials.". Turkish neurosurgery. 25 (4): 544–51. doi:10.5137/1019-5149.JTN.9270-13.0. PMID 26242330. ↑ Yuan, ZH; Jiang, JK; Huang, WD; Pan, J; Zhu, JY; Wang, JZ (June 2010). "A meta-analysis of the efficacy and safety of recombinant activated factor VII for patients with acute intracerebral hemorrhage without hemophilia.". Journal of Clinical Neuroscience. 17 (6): 685–93. doi:10.1016/j.jocn.2009.11.020. PMID 20399668. ↑ Lancet. 2004 Oct 9-15;364(9442):1321-8.Effect of intravenous corticosteroids on death within 14 days in 10008 adults with clinically significant head injury (MRC CRASH trial): randomised placebo-controlled trial. ↑ Lancet. 2005 Jun 4-10;365(9475):1957-9. Final results of MRC CRASH, a randomised placebo-controlled trial of intravenous corticosteroid in adults with head injury-outcomes at 6 months. ↑ Hansen, B.M. ; Nilsson O.G. ; Anderson H; et al. (Oct 2013). "Long term (13 years) prognosis after primary intracerebral haemorrhage: a prospective population based study of long term mortality, prognostic factors and causes of death". Journal of Neurology, Neurosurgery & Psychiatry. 84 (10): 1150–1155. doi:10.1136/jnnp-2013-305200. ↑ Wang J (December 2010). "Preclinical and clinical research on inflammation after intracerebral hemorrhage". Prog. Neurobiol. 92 (4): 463–77. doi:10.1016/j.pneurobio.2010.08.001. PMC 2991407 . PMID 20713126. ↑ Wu H, Zhang Z, Hu X, Zhao R, Song Y, Ban X, Qi J, Wang J (2010). "Dynamic changes of inflammatory markers in brain after hemorrhagic stroke in humans: a postmortem study.". Brain Research. 1342 (1342): 111–1117. doi:10.1016/j.brainres.2010.04.033. PMC 2885522 . PMID 20420814. ↑ Page 117 in: Henry S. Schutta; Lechtenberg, Richard (1998). Neurology practice guidelines. New York: M. Dekker. ISBN 0-8247-0104-6. ↑ Copenhaver BR, Hsia AW, Merino JG, et al. (October 2008). "Racial differences in microbleed prevalence in primary intracerebral hemorrhage". Neurology. 71 (15): 1176–82. doi:10.1212/01.wnl.0000327524.16575.ca. PMC 2676986 . PMID 18838665. Hemphill JC, 3rd; Greenberg, SM; Anderson, CS; Becker, K; Bendok, BR; Cushman, M; Fung, GL; Goldstein, JN; Macdonald, RL; Mitchell, PH; Scott, PA; Selim, MH; Woo, D (28 May 2015). "Guidelines for the Management of Spontaneous Intracerebral Hemorrhage: A Guideline for Healthcare Professionals From the American Heart Association/American Stroke Association.". Stroke; a journal of cerebral circulation. 46: 2032–60. doi:10.1161/STR.0000000000000069. PMID 26022637. Wikimedia Commons has media related to Cerebral hemorrhage.